He played 332 games in the Bundesliga, scoring 22 goals. 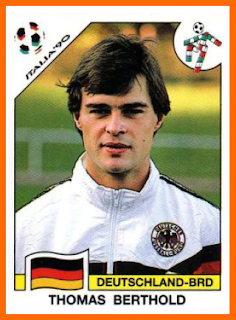 He began his career in 1982 with Eintracht Frankfurt and played for them until 1987. From 1987 until 1991 he played in Italy: for Hellas Verona (1987–1989) and AS Roma (1989–1991). He then returned to Germany, signing for FC Bayern Munich (1991–1993) and VfB Stuttgart (1993–2000). Berthold's last season as an active player was with the Turkish league club Adanaspor for whom he played until 15 January 2001. Between 1985 and 1994 Berthold made 62 international appearances, scoring 1 goal, for the West German and German national football teams, participating in the 1986 FIFA World Cup in Mexico and UEFA Euro 1988 in West Germany. He was a member of the West German team which won the 1990 FIFA World Cup, but wasn't at the German team which took second place in the European Football Championship in Sweden in 1992. His last appearance in international competition was in the 1994 FIFA World Cup.